Smiling’s My Favorite | What's Up, Ya Sieve? To accurately tell you how much work I have to do, I’d need one of those “to the power of” superscript numbers next to infinity. Which isn’t even enough. But how am I supposed to work under these conditions?! OF COURSE YOUR FIRST GOAL WAS AGAINST FLOWER! Don’t get any ideas about tonight vs. the Penguins because you are on imaginary boyfriend suspension while playing vs. Pittsburgh. Those are the rules, Johnnycakes. He didn’t “have any issues with fumbling it.” I swear, people. Guess what else isn’t an issue here? John’s front teeth are MISSING. Remember when he pulled ’em out on the bench? Well those were already fake, replacing the real ones knocked out in preseason. Apparently he’s no longer nervous around Kathryn Tappen because he didn’t bother to get them put back in. That’s our kind of guy. 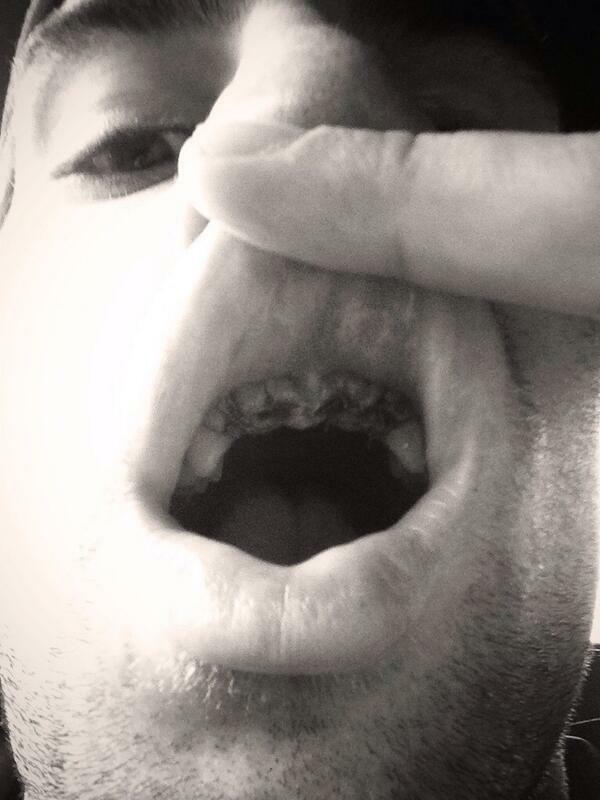 Side note: I missed this picture John Tweeted the other day of his mouth pre-implants. I’m putting it behind the jump because it’s SUPER gross and I almost cried. God, hockey players are tough. I want to hurl. Un-thanks to Alison for making sure I saw that. Presumably there is more to this interview which will delay future work in a hysterical bout of blogging. I am ready. PS: Before you all say, “Remember that time on How I Met Your Mother…,” here is the gif. Robin Sparkles 4EVA. That Robin gif so very accurately describes my feelings about hockey players & teeth. Remember that time that Joe Thornton’s eyeball was completely black and I didn’t even care? So hot.